Baking in salt-crust is a technique usually applied to fish, meat, potatoes, beets and sometimes celery roots. In fact, a lot more vegetables can be covered in coarse sea salt and baked in the oven, where the salt-crust not only seasons the vegetable, but also keeps all the flavors inside. This time I experimented with salt-baked kohlrabi, which developed into a magnificent result. 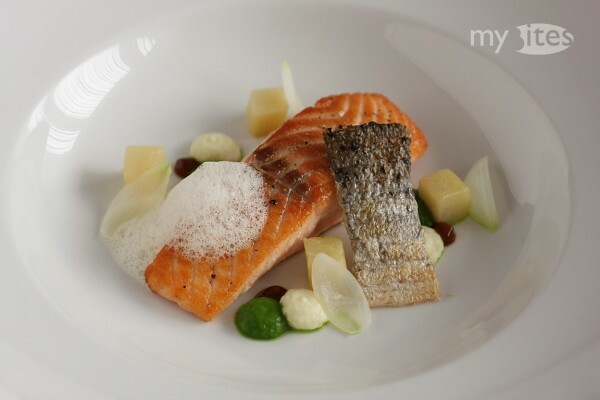 This entry was posted in Fish, Main Course and tagged fish, foam, juniper berry, kohlrabi, kohlrabi leaf, main course, malt extract, onion, peanut butter, pink salmon, puree, salmon on June 7, 2012 by Robert. Cauliflower is a vegetable that can be stored quite well, and therefore it is available throughout almost the whole year. Actually, the real season for cauliflower – at least in Europe – is about right now. During spring and summer fresh cauliflower can be sourced from local farmers in white, green, orange or purple colors. Usually, cauliflower is picked into florets and cooked or steamed tender, or it is sometimes prepared as a creamy soup. 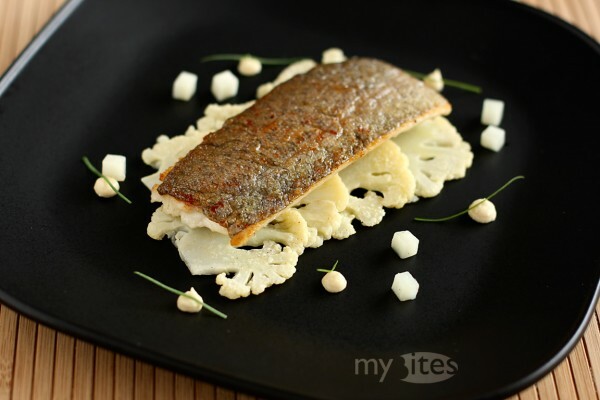 In this recipe I cooked the cauliflower slightly different than usual and served it with a crispy roasted trout fillet. 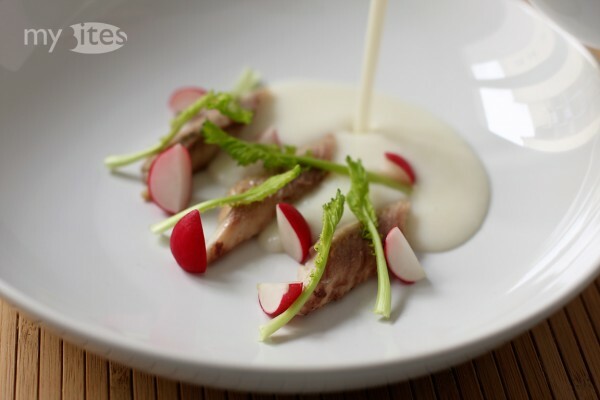 This entry was posted in Fish, Main Course and tagged cauliflower, fish, lemon, lemon puree, main course, poppy seed, rainbow trout, trout, white poppy seed on May 31, 2012 by Robert. 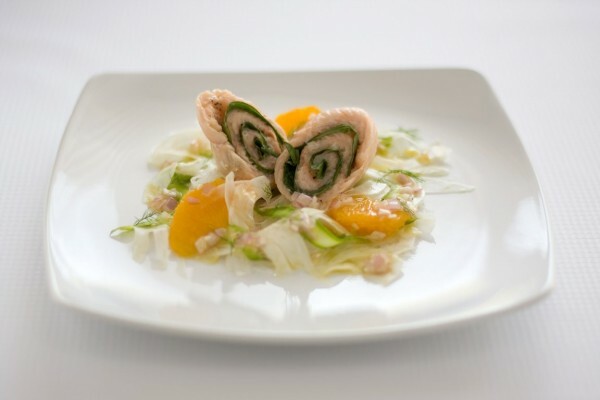 Have you ever wondered why fish in Germany – and almost everywhere in Europe – is gutted with a cut at its belly? It’s straightforward to some extent, because all innards are located in the belly, and by removing them along with the gills, the fish can be kept refrigerated 3-4 days longer. In China I noticed that fish are usually kept alive in restaurants and killed to order. An even more interesting experience was to see that all fish was cut open and gutted from its back, so the bellies of the fish were always completely intact. 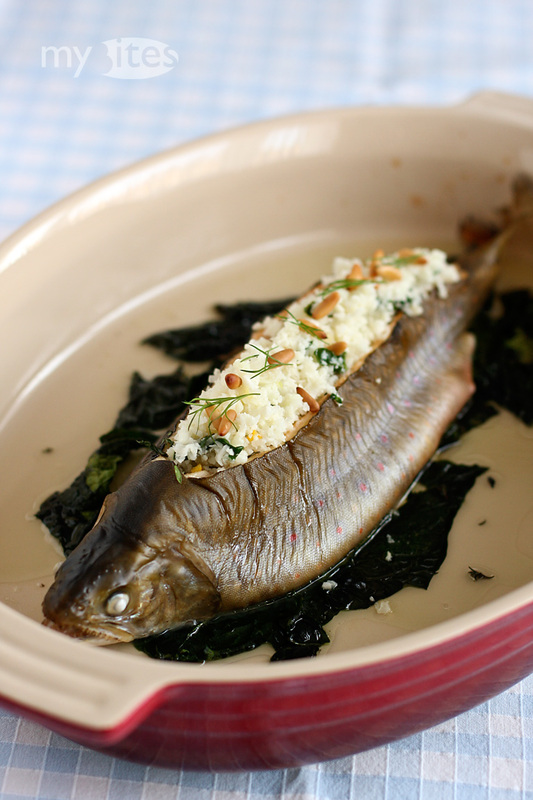 I liked this back filleting method simply because the possibilities of stuffing and serving a whole fish. Unfortunately, at the local market in Erlangen they don’t sell any fish alive and all of them are already gutted via a cut along their bellies. So my filleting from the back basically resulted in two fillets held together by the head and the tail of the fish, but made the seasoning of the whole fish a lot simpler and more precise. This entry was posted in Fish, Main Course and tagged cauliflower, char, couscous, dill, fish, pine nut, salvelinus, tarragon, thyme, trout on February 27, 2012 by Robert.